In celebration of the release of the vinyl and digital versions of Luz de Vida: A Compilation to Benefit the Victims of the Tucson Tragedy, The Home Stretch will host Golden Boots live in-Studio 2A Friday Oct. 21st at 5:30pm. This performance with Golden Boots and interview with representatives from Music Against Violence is a precursor to Saturday's benefit concert at The Rialto Theatre, with a dozen of the compilation's performers. 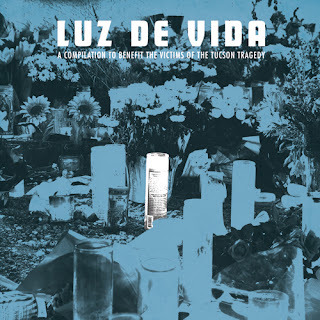 Tucson's Fort Lowell Records and Music Against Violence are pleased to announce Luz de Vida: A Compilation to Benefit the Victims of the Tucson Tragedy. The record was released on Oct. 18, during the international Week Without Violence. It will be available in two formats, a 37-track digital album and a special limited-edition 12-song vinyl release, with exclusively Tucson bands. All proceeds from the sale of Luz de Vida will go to the Tucson Together Fund, the official fund established to assist victims, families, and witnesses of the January 8th tragedy. A benefit concert will be held at the Rialto Theatre on Saturday, Oct. 22. and will feature Joey and John from Calexico, Kiss and the Tells, Salvador Duran, Reno Del Mar, Mariachi Luz de Luna, HAIRSPRAYFIREANDGIRLS, Tracy Shedd, La Cerca, Golden Boots, Silverbell, Rich Hopkins, and Tom Walbank. The compilation includes songs from Tucson bands Calexico, Giant Sand, Rainer, Dead Western Plains, Lenguas Largas, Holy Rolling Empire, Sergio Mendoza y La Orkesta and many others. Additionally, national artists with a special bond to Tucson have contributed music, including Neko Case, Spoon, DeVotchKa, Jimmy Eat World, Meat Puppets, Robyn Hitchcock, Ozomatli, John Vanderslice, Chuck Prophet and Jon Rauhouse with Rachel Flotard.